The Surface Hub is a massive touchscreen with a PC built into it. Microsoft made it as an enterprise product – after all, it costs upwards of 20,000$ to own one. InFocus seems determined to do the same thing for cheaper, a lot cheaper. InFocus developed the MondoPad lineup after the turmoil it went through in 2009. Designed as a tool to increase collaborative efficiency between teams, it uses a custom interface built on top of Windows – featuring a whiteboard, web browser, video conferencing tools and much more. While the development did start in 2010, the first one of the products came out in 2011 – and so began the journey to today. Today InFocus announced a few new additions to the MondoPad lineup. InFocus already makes two 70-inch MondoPad models – but the ones announced today come with a 4K display. It’s not just a resolution bump, though, as these also feature “projected capacitive touch technology” as InFocus likes to call it. The new MondoPad models use the same capacitive touch technology that is used on your smartphone, allowing for better response times, fluid multi-touch support and an edge-to-edge seamless glass panel. The MondoPad is an obvious competitor to the Surface Hub – a Microsoft product that promises to offer the same (or better?) at a significantly higher cost. InFocus describes the MondoPad as “more flexible, more configurable, more enterprise-friendly [and] more affordable” than the Surface Hub. They might be right about the ‘more affordable’ bit – the Surface Hub starts at $8,999, but comes with a 55-inch 1080p display, and ends at 21,999$, which comes with an 84-inch 4K display. InFocus is offering the 70-inch 4K MondoPad for 13,999$. 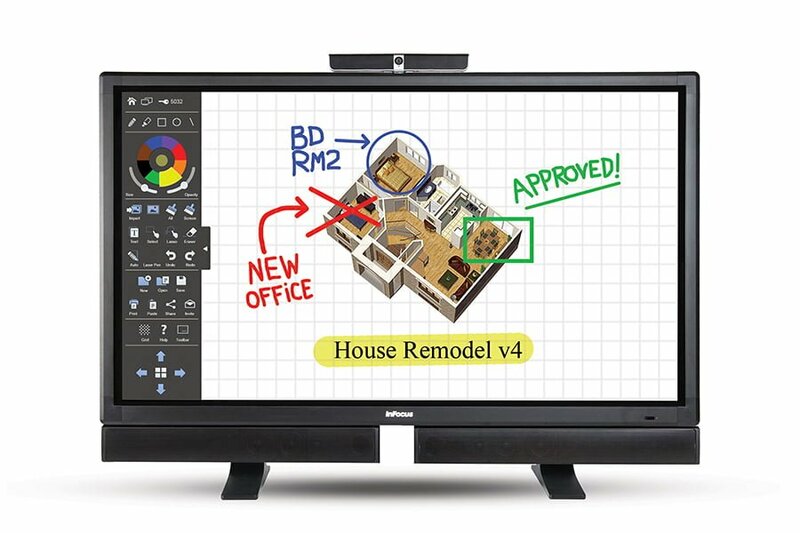 The price difference is quite significant – InFocus also has two more models of MondoPad coming up soon with 80-inch and 85-inch displays. The price for these have not been announced yet – perhaps they are waiting for Microsoft’s move.